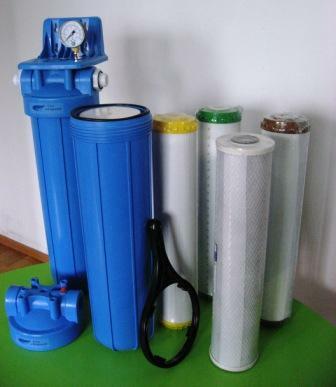 Suitable cartridge (length x diameter) 20 " x 4 1/2 "
Installation of the filter must be carried out with the assumption that the rigid connection with the metal pipes don't leave mechanical strains to the screw connections, which can lead to cracks in the plastic housing. Threaded bendy hoses with wire mesh suit well for connecting plastic filters. Filters are fastened to the wall by brackets in a vertical position. It has to have enough space from the floor, that you have room to unscrew the casing and change the cartridge element. To simplify the element change, suitable valves are are installed in the input and output. Filters can be connected in parallel to increase productivity. Filters can be connected in series for many different actions to take place at the same time (mechanical filtering - different possibilities for choosing a cartridge 5-20 micrometers, softening, enhancing the taste of water with activated carbon, for example through removing chlorine and organics, removing bivalent iron). For hygienic reasons it's recommended to change cartridge elements after every 6 months.